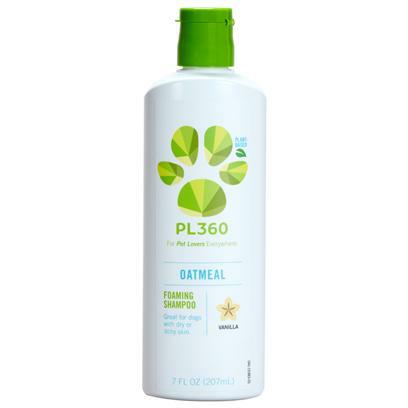 PL360 Oatmeal Foaming Shampoo helps nurture dry skin using a plant-based formula that foams instantly and rinses quickly. Great for dogs with dry or itchy skin. Purified water, special gentle blend of plant-derived biodegradable (anionic & non-ionic) cleansers, PEG-7 glyceryl cocoate (coat brightener), glycerine (moisturizer), hydrolyzed wheat protein (conditioner), cocamidopropyl PG-diammonium chloride phosphate (soothing), hydrolyzed soy protein (hair & skin conditioner), hydrolyzed oat protein (hair & skin conditioner), lauryl alcohol (detangling), phenoxyethanol (preservative), vanilla fragrance.